Hey there, I know I just wrote a post last night, but I think this is crazy ironic! Last night, I wrote a blog about how changes in the weather could lead to an increased travel time for us commuters. I talked about the importance of leaving earlier than usual to ensure that you get to class on time. So, this morning, I left for school with about an hour and a half to get there (my commute typically takes an hour) because the weather had called for some rain and I felt it would be better to be safe than sorry. So I started my drive, I was singing my songs and living the dream, when BAM! A MAJOR PART OF MY ROUTE WAS UNDER CONSTRUCTION AND A WHOLE CHUNK OF ROAD WAS CLOSED OFF! So, I ended up taking a detour route which set me back significantly. By the time I finally arrived to my first class, I was 15 minutes late and super upset! 1. I took pictures of the detour/construction signs I passed so that I could provide my professor with proof of my adventure. 2. I talked to my professor after class ended to explain why I was late. I was honest and sincere with him which went a long way. He told me he hadn’t even noticed I was late but that he appreciated my honesty and was sympathetic for my situation! No points deducted! 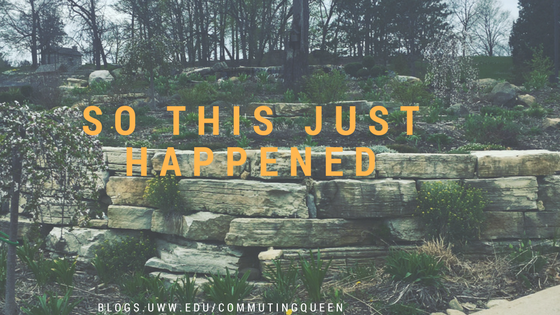 So, the moral of this story is that crazy stuff can happen when you’re a commuter student! As long as you are honest and genuine about your experiences, you should have a positive overall experience! This entry was posted in Commuting Adventures and tagged commute, construction, detour, drive, genuine, honest, positive, time. Bookmark the permalink.